A trailer for The Last of Us Grounded DLC has been released on the PlayStation YouTube channel and given all of the information that is packed into the video, we know that there will be four new maps introduced as well as a handful of other things like weapons and skills. The Reclaimed Territories component of the DLC bundle will include four maps, Wharf, Capitol, Coal Mine, and Water Tower. On top of the new maps are single player and multiplayer features like the new Grounded Mode for the single player campaign. If you manage to get through the campaign on Grounded–the marketing material makes it sound very difficult to do so–then you can get the “Completed Grounded Mode” trophy. There are trophies attached to all of the maps in the Reclaimed Territories map pack as well, so you have more than enough to work towards with this DLC. Lastly, some new weapons and skills are being added to the game as part of the DLC. The weapons are part of the Survivalist Weapons Bundle which comes with the Specter, Double Barrel, Enforcer, and Launcher. All of the weapons will be available to try before you spend any money on them, as they are included in some pre-set load outs. As for the skills, two bundles are being released this week. The Situational Survival Skills and Professional Survival Skills. 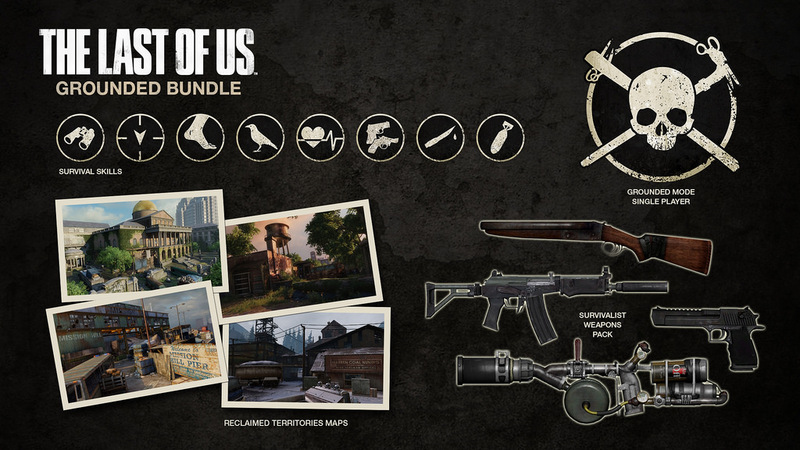 According to last month’s PlayStation blog post that explained the Grounded DLC, the bundles will include skills like Agility, Scavenger, Gunslinger, and Executioner. Depending on your play style in The Last of Us, these skills may very useful. As long as you have a Season Pass, you will be able to get all of the DLC content in the last DLC drop for The Last of Us, which is beneficial since there is still a little ways to go before the PS4 version of the game is released. The Last of US: Remastered will be released for the PS4 this year and for the most part, it is an upscaled 1080p version of the game. However, it does sound like some new features and bonuses will be found within it. Summary: The Last of Us ‘Grounded’ DLC trailer has been released. The DLC content will be put on the PlayStation Store this week.